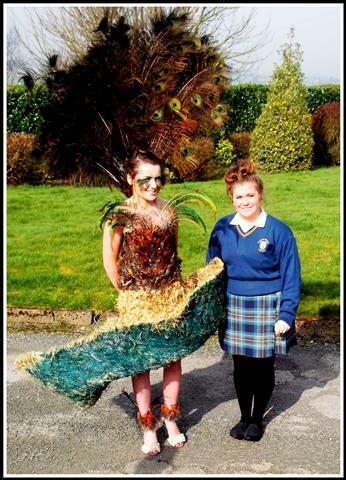 As part of a Transition Year module in school, Joanne Doran entered ‘Junk Kouture’, which is a competition for all schools in Ireland. Students have to make an outfit out of recycled material. Her dress is made of hay, peacock and pheasant feathers and egg-shells. 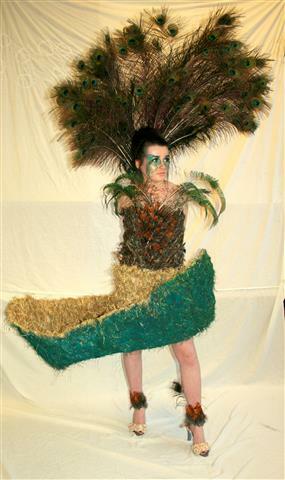 Joanne has now reached the GRAND FINALE of the recycled fashion competition Junk Kouture which takes place in the O2 in Dublin soon. She is now looking for votes again. Voting opened on Monday 14th April at 9am and continues until Friday 25th at midnight. To vote log on to www.facebook.com/ERPIreland and click on ‘E’ (for east region). The name of the dress is ‘HEY BIRD’. Each person can vote once daily and she would be very grateful if you would vote for her outfit. 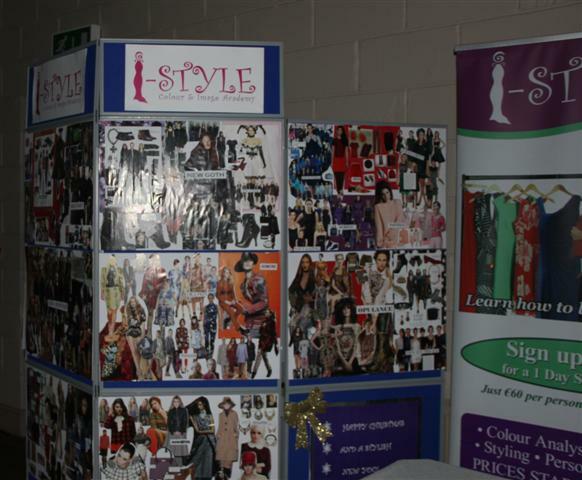 As part of a Transition Year module in school, Joanne Doran entered ‘Junk Kouture’, which is a competition for all schools in Ireland. Students have to make an outfit out of recycled material. Her dress is made of hay, peacock and pheasant feathers and egg-shells. Joanne has got through to the regional finals and is now looking for votes. The votes are 10% of the total score. Voting is open Monday 24th of February until Friday 28th of February on www.facebook.com/ERPIreland. The name of Joanne’s dress is ‘HEY BIRD’. Each person can vote once daily and she would be very grateful for your votes. 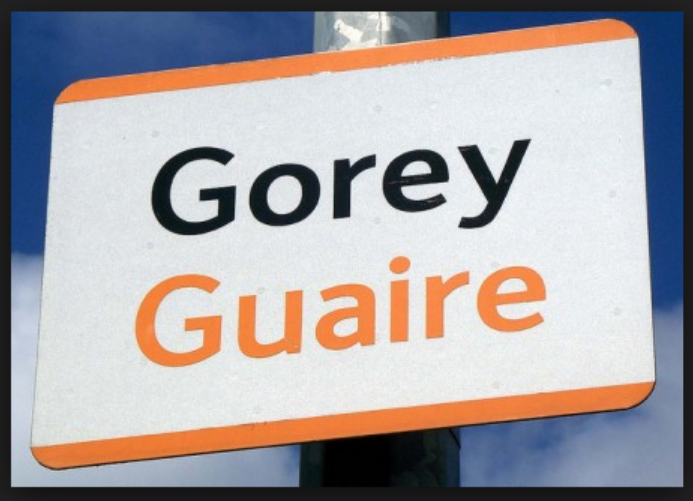 Read the full article on Gorey’s attractions here. Gorgeous Gúnas – a great night out! Thanks to all who supported in any way, those who attended, our gorgeous models, Ann of HairSalon Ferns for doing the models hair, Paddy Byrne and Doug for music, Talk to Tom Charity Shop Gorey, McMullen’s Arklow and Arklow Shopping Centre and the individual businesses who took tables on the night. Some of the pics of the preparations and of the night itself. Get tanned, threaded and tipped. Enjoy a good night out. Come and join us tonight in Askamore Hall – 8 pm – €5. Come along ladies for a great night out – get style and fashion tips and advice, see how to update your clothes with the addition of accessories, check out some lovely dresses and separates at rock-bottom prices, get a full body tan done for €10, hand massage, nail manicure, threading, hair advice, door prize, raffle and have a glass of wine with us. Fantastic night out – and all for €5. See you in Askamore Hall this Friday night, November 30th, at 8pm. This is being run as a fundraiser for Askamore Community Council, our local community development group. For a great night out girls – for a fiver! Friday, November 30th, 8pm – €5. 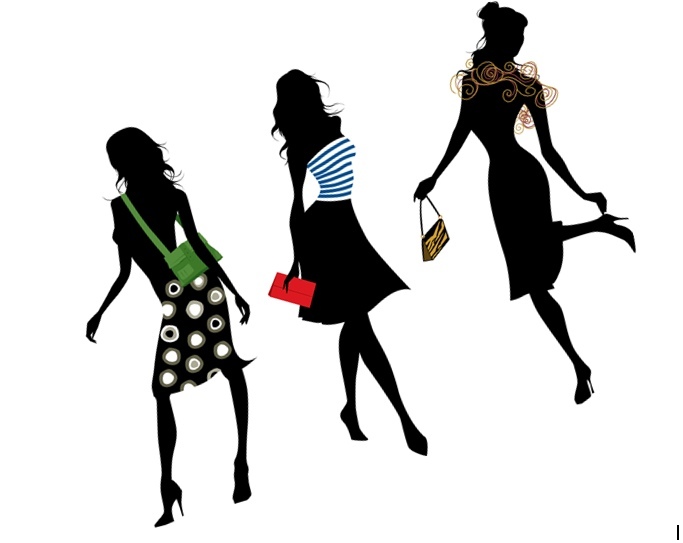 Check out the clothes, style, fashion, hair and make-up tips. Have a glass of wine with us – and some cheese. Tickets now available from :Jo McLellan, Paula Mulroe, Ann Gilbert, Stacy Gilbert, Mary Donohoe, Catherine Byrne, or ring Lorraine on 087 6975559.